Sea turtles, dolphins, chameleons, lemurs, are our usual hosts. Our charming bungalows, equipped with all modern comfort, are melted in the nature. Located on a private beach: an exceptional place that offers the simple joy of life, the user-friendliness. 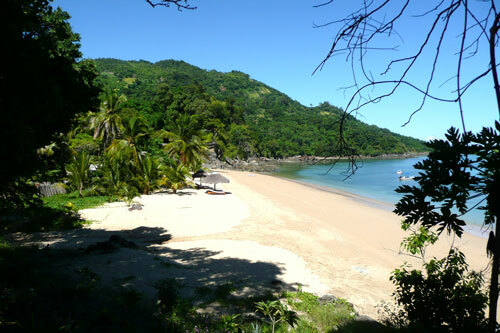 The ideal starting point for all excursions possible in the bay of Nosy Be. For those who just love to stretch out on the beach or those who are eager for activities, we will make your stay unforgettable! This coast, sheltered by Africa, present the advantage to be particularly protected from cyclones. 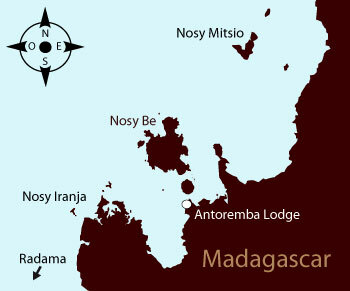 The lodge is situated in front of the island of NOSY BE. With 330 days of sun and its microclimate, the region benefits from a particularly luxuriant and varied vegetation. We find numerous plantations there, including those of cocoa, coffee, aromatic plants, pepper and pink bays(berries).